Quarry Drilling . Virginia . Tennessee . Mid-Atlantic . Richard Simmons Drilling, Co., Inc. . Whether drilling in limestone or granite quarries, or building foundations. 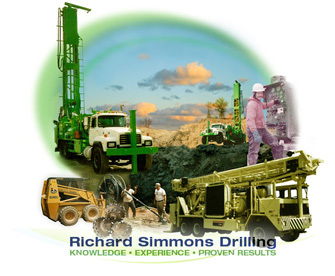 Richard Simmons Drilling Co., Inc. meets the needs of customers in every drilling application. Our professional drilling crews are experienced in most every application of rock drilling and are experts in working with a variety of truck and track mounted drills. All personnel are experienced quarry drillers with OSHA and MSHA training and certification. Most of our 45 year tenure has included contract drilling. Our clients include O-N Minerals, Boxley, Rockydale Quarries, Austinville Limestone, Vulcan Materials, and Titan America. Our men and equipment are ready to respond to all your drilling needs — even to such emergencies as mining accidents and underground leakage problems.